Forty-odd miles as the crow flies from Holy Isle lies Jura. It drifts off mainland Argyll in a sea littered with small islands and skerries. Its smooth-edged bulk is impressive on the map, almost severed in the middle where a big indentation on the Atlantic west coast pinches the island to a narrow waist of land. It contrasts with neighbouring Argyll whose coastline is in tatters, a succession of long skinny peninsulas. From the sea, Jura is even more imposing, as the cliffs rear up like a fortress from rocky shores. Above rise the three distinctive hills of the Paps, those softly rounded breasts of pale scree which are so compelling on the eye from every vantage point. As the ferry ploughed along the east coast of Jura, there were few houses or trees on this wind-cleaned island. I glimpsed the single track twisting its way twenty-five miles along the island past the tiny hamlet of Craighouse to its dead end at Ardlussa. From the ferry, Jura appeared to be near empty; it is one of the least populated islands on the west coast. ‘There is nothing’, is how people describe the place; either as an expression of appreciation or horror. The writer Kathleen Jamie called it ‘fabulous nothing’. Only slightly smaller than the Isle of Wight with its population of 133,000, Jura has 188 inhabitants. Jura is a fabulous illustration for the islophile dreams of three nations — Scotland, England and Britain — and how they have been exported. Over the course of the last century an Australian hedge fund manager, a second-generation American immigrant millionaire and a penniless English writer have all been seduced by the bleak grandeur of Jura. These disparate characters offer a glimpse into the multifaceted history of how islands have been used both as places of prestige and status, as well as of insight and creative solitude. Even more erroneously, England is sometimes described as an island. Martin Amis wrote a television essay on England in 2014, and the voiceover began to images of waves pounding chalk cliffs, and the quintessential English mistake, ‘England is an island nation’. Our Island Story: a history of England for Boys and Girls (published in 1905) was a popular children’s history for several generations; the Conservative Prime Minister David Cameron (himself a visitor to Jura), raised in the seventies, cited it as his favourite childhood book. In the eighteenth century, after the 1707 Act of Union with Scotland, the island theme became a unionist project for reform and progress. The unionist, Daniel Defoe, entitled his book of journeys in 1724-27, A Tour thro’ the Whole Island of Great Britain, a title which made clear its political commitment to the island now made whole. In Defoe’s descriptions, the island was a place of energetic activity, reordered for building, farming and hunting; it was to be ‘improved’, a term which became deeply political in Scotland. Johnson was enchanted by the island of Raasay, east of Skye: ‘without, is the rough ocean and the rocky land, the beating billows and the howling storm; within is plenty and elegance, beauty and gaiety, the song and the dance.’ On another occasion, Johnson expanded on what he would do, if given the island of Isa in Loch Dunvegan: ‘Dr Johnson liked the idea and talked of how he would build a house there, how he would fortify it, how he would have cannon, how he would plant, how he would sally out and take the isle of Muck, and then he laughed with uncommon glee and could hardly leave off,’ Boswell recounted. But within a few pages, such mirth and enthusiasm had given way to its opposite when bad weather delayed their journey. Dr Johnson complained to Boswell that ‘it would require great resignation to live in one of these islands. If you were shut up here, your own thoughts would torment you.’ Boswell agreed, describing how ‘we were in a strange state of abstraction from the world’. Johnson wrote of the danger of brooding when stranded on an island: ‘the phantoms which haunt a desert are want and misery and danger: the evils of dereliction rush upon the thoughts; man is made unwillingly acquainted with his own weakness.’ Islands can be both places of delightful retreat and maddening frustration — heaven or hell. In British literature, islands emerge as places of particular power; they offer magic, intrigue and adventure as well as damnation. Many of the most influential depictions can be traced to the Hebrides. Treasure Island, Peter Pan, Swallows and Amazons and Lord of the Flies are all set on islands, and three of these authors — Robert Louis Stevenson, J.M. Barrie, and Arthur Ransome — spent formative periods of time in the Hebrides. Some island lovers want to do more than visit — they want to live out their own Robinson Crusoe dream and create their own ‘blessed plot’. The Astors and the Australian billionaire on Jura were the first intimation of a recurrent theme on my journey north-west through the Hebrides: flamboyant, sometimes eccentric islophiles went to extraordinary lengths at huge cost to create their ‘little world’ on remote islands. Throughout the nineteenth century, mansions and grand estates were built in the Hebrides. Perhaps one of the most remote and compelling is that of the Dundee linen manufacturer, Erskine Beveridge, who sunk a handsome portion of his family fortune into a house, long since a ruin, on the tidal island of Vallay off the coast of North Uist in the Outer Hebrides. The imposing baronial roofline looms over the sands; inside, the rich coloured paintwork, panelled bay windows and tiled fireplaces still convey the glamour. For some of these ventures, no expense was spared; stone and soil were imported to build dreams on rocky outcrops in the Atlantic. Once the island estates were bought, the mansions built and the gardens laid out, these plutocrats then discovered that they had subjected themselves to the uncertainties of the West Coast climate; while they had mastered much of the universe, they were still at the mercy of the winds and tide tables when it came to getting or leaving home. The unpredictable accessibility of islands was central to the plot in one of the British film director Michael Powell’s most famous films, I Know Where I am Going in 1945. The glamorous Londoner heroine heads to a Hebridean island to be married to her fiancé, and ends up stranded on the mainland by heavy storms, where she falls in love with another stranded passenger. Islands can throw you off course, they are places of the unexpected and that is part of their appeal. It is particularly true of the Hebrides. The crazy edginess of islands can provoke a volatile intensity — even in rationalists such as Johnson. This was the subject of a haunting novella by D.H. Lawrence, The Man Who Loved Islands, said to have been inspired by the islophile, Scottish nationalist and writer, Compton Mackenzie. He lived on a succession of islands — Capri, Herm and Jethou in the Channel Islands — before moving to Barra in 1928 where he lived for nearly twenty years. Lawrence’s novella, set in the damp mists and gales of unspecified islands, is a cautionary tale of the seductive dangers of islomania. Mackenzie triggered Orwell’s interest in the Hebrides before David Astor (owner of an estate on Jura) encouraged him to go to Jura. Along with close associates such as Hugh MacDiarmid, the Scottish nationalist, poet and writer, Mackenzie helped establish the Hebrides in a new role as a place of refuge, solace, even salvation for a civilization in crisis in the middle of the twentieth century. During these decades, fault lines were emerging in Britain’s identity as an empire in decline which became central to Orwell’s writing. The Hebrides offered an artist a vantage point, suggested Mackenzie, near enough to still be at home, far enough away to salvage some perspective — the only consolation available — in a terrible half-century of violence. Islomania in the Hebrides shifted beyond the confines of a few wealthy plutocrats, and became an absorbing passion for a succession of writers and, as the publishers spotted, their readers. For writers, there was the attraction of a Crusoe fantasy and cheap rents. Orwell’s sister, Avril Blair, described his fascination with putting Barnhill (the house he rented on Jura in 1946) to rights. A couple of years later, the writer Gavin Maxwell was doing likewise at Sandaig further up the West coast overlooking Skye. The latter’s beachcombing for fish boxes with which to furnish his croft forms the opening chapter of his bestseller, A Ring of Bright Water, published in 1960. Many of these writers in the middle twentieth century shared a sense of crisis and decline. This prompted their urge to escape, either salvaging the means for their own survival, or in search of inspiration for the process of renewal. Orwell’s friend, Cyril Connolly, wrote in 1929: ‘I am tired of this country. I do feel it is a dying civilization — decadent but in such a dull way — going stuffy and comatose instead of collapsing beautifully like France.’ Orwell was sympathetic to these ideas. His loathing of twentieth-century, urban, industrial Britain was the vivid setting for his dystopian portrayal of state authoritarianism in Nineteen Eighty-Four, the novel he wrote in Barnhill. A keen and knowledgeable naturalist, on Jura he was surrounded by the natural world, and he plunged into the demanding physical exertions of crofting, hunting and fishing. He set up his typewriter in front of the window overlooking the sea, and with that vista in front of him, he infused the novel with a pervasive horror at the dirty, urban tedium which formed its setting. The islands inspired a wealth of books during the thirties and forties with readers hungry to hear more of their beauty, distinctive culture and echoes of a peasant life now long lost further south. The books were sometimes sentimental, sometimes purple in their prose, but they fed the British imagination. One of the best of the crop was the breathless Island Going by an Oxford student, Robert Atkinson, with its exuberant tales of derring-do and ornithology on far flung Hebridean islands, such as the rat-infested Shiants, a group of islands off the east coast of Lewis, and the gentler occupation of Leach’s Petrels on Rona, forty miles north of Lewis. This romantic escapism to north-west Scotland contrasted sharply with the Scots’ own deep sense of gloom over the state of their nation, captured by Edwin Muir in A Scottish Journey in 1935 in which he talked of a ‘silent clearance’ in which ‘Scotland is gradually being emptied of its population, its spirit, its wealth, industry, art, intellect and innate character’. The country was in deep economic crisis but this did not seem to impinge on many of the writers who headed north in search of the solace of the natural world. All that is still greatest in literature and art and philosophy was created not in the great cities […] but under conditions destitute of all these modern blessings and, for the most part, in places as lonely and bare as these islands are. In short megalopolitan cultures can ill afford to affect superiority to these little poorly inhabited places; they have contributed far more to the spiritual wealth of mankind than the great cities have done or seem at all likely to do. A comparable moral project was threaded through the books of the English ecologist, Frank Fraser Darling. He recounted his extraordinary feats of endurance on the Scottish island of Rona, forty miles north of Lewis, and later on the island he bought in 1937, Tanera Mòr in the Summer Isles. His two books, Island Years and Island Farm, published in 1940 and 1943, had a passionate ambition to reconnect urban industrial Britain with the natural world. He scorned the comforts of modernity to demonstrate a visceral engagement with nature and its elements — the rain, storms and wild tides — and celebrated the dirt and sweat of his smallholding and husbandry. There are few descriptions of Hebridean incomer life more daunting than his account of the backbreaking rebuilding of the small jetty on Tanera Mòr, as he dragged rocks into place along with his wife. For city dwelling readers in the midst of a terrible world war, it was a brilliantly conceived reminder of the natural world as well as a form of escapism: a glimpse of a world long lost in England, the absorbing physical struggle with the elements offering some distraction from the anxiety and violence of war. A new generation of writers have drifted back to the Hebrides in the early decades of the twenty-first century, though this time, they come as passing visitors; not for them the hardship of experiments in self-sufficiency. Several have found their way to Jura, inspired by Orwell. The opportunities for perspective are still compelling; novelist Will Self writes how either at the outset or towards the completion of a book, he retreats somewhere distant, often by the sea, often in Scotland: ‘islands were good, because they were discrete and legible — in the way books are.’ Self concluded that, ‘there remained a part of me — the ultimately skeptical anthropological observer of it all — that is forever marooned in the North Atlantic, peering curiously at this unhappy ant heap of mass human society.’ Kathleen Jamie and Robert Macfarlane have found the appeal of islands less as a vantage point for a critique of urban Britain, than as a delicate, insistent evangelizing project for the reader to pay attention to the fragile natural world and to the language we use to imagine it. Tucked into the middle of this century-long history of writers and their love affairs with the Hebrides, is Orwell, its most celebrated exponent. On Jura, Orwell found the clarity of vision for a piece of fiction which shaped an age. From his remote point on north Jura, he had the critical distance not just to see his own times clearly, but to divine in them the threat they posed to human freedom. He imagined a way of framing a question which can be asked of any age: what freedoms do this moment in history make hard or impossible to imagine? It was a perspective only possible from an island, only imaginable in such remote isolation. Madeleine Bunting is a writer and journalist. She founded the Mindfulness Initiative in November 2013 with Chris Cullen, and is an associate of the Oxford University Mindfulness Centre. She has written three books and is a regular commentator and broadcaster for amongst others, the Guardian, BBC and the Tablet. 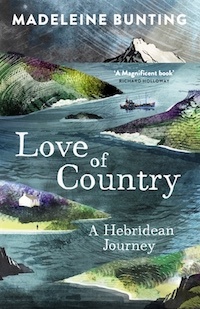 Her latest book is Love of Country: A Hebridean Journey (2016).